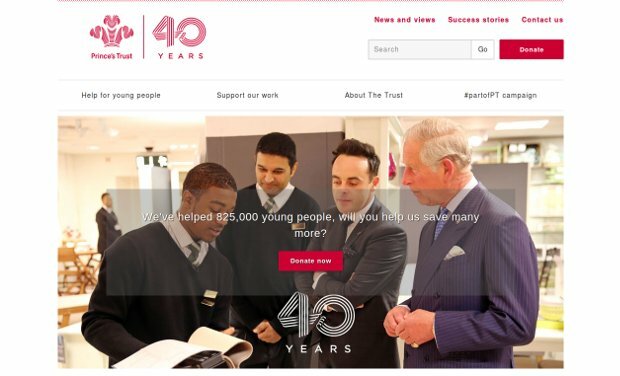 The Prince’s Trust supports 13 to 30 year olds who are unemployed and those struggling at school and at risk of exclusion. In fact, around one in five young people in the UK are not in work, education or training. Youth unemployment costs the UK economy £10 million a day in lost productivity, while youth crime costs £1 billion every year. Many of the young people they help are in or leaving care, facing issues such as homelessness or mental health problems, or have been in trouble with the law. Their programmes give young people the practical and financial support they need to stabilise their lives. They help develop key skills, confidence and motivation, enabling young people to move into work, education or training. They run programmes that encourage young people to take responsibility for themselves – helping them build the life they choose rather than the one they’ve ended up with: the Enterprise programme provides money and support to help young people start up in business; The Team programme is a 12-week personal development course, offering work experience, qualifications, practical skills, community projects and a residential week. Get Started are short courses designed to help young people develop new skills, build confidence and have fun, helping them to move forwards in their lives. Get into are short courses offering intensive training and experience in a specific sector to help young people get a job. Development Awards are small grants to enable young people to access education, training or work. Prince’s Trust xl clubs give 13-19 year olds who are at risk of truanting, exclusion and underachievement a say in their education. They aim to improve attendance, motivation and social skills. The Fairbridge programme works with young people aged 13-25, giving them the motivation, self-confidence and skills they need to change their lives.